Irish charms are a blessing to hold. Many of these charms would make ideal Irish pocket tokens. 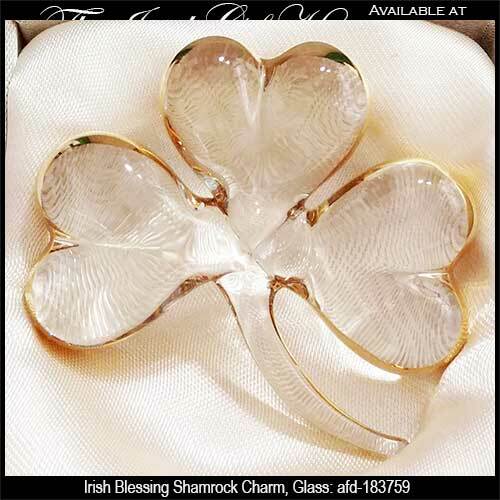 Most of these Irish charms feature a blessing along with glass or pewter construction. Several of these Irish tokens would be ideal as wedding favors. Contact The Irish Gift House about quantity discounts for volume orders. 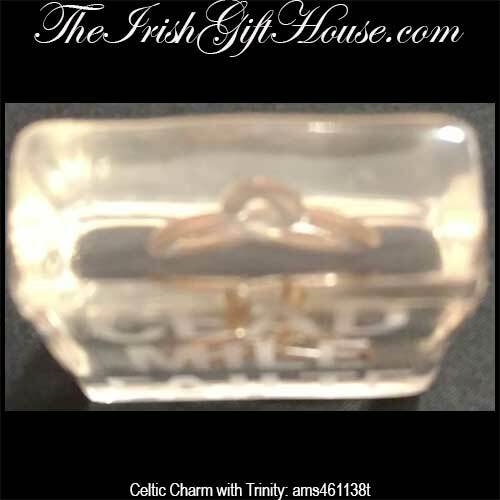 This crystal Irish charm features a laser created Celtic harp along with clovers within the solid block. This green glass Irish charm is blown in the shape of a leprechaun's hat. This green glass Irish charm is reminiscent of a chocolate kiss. 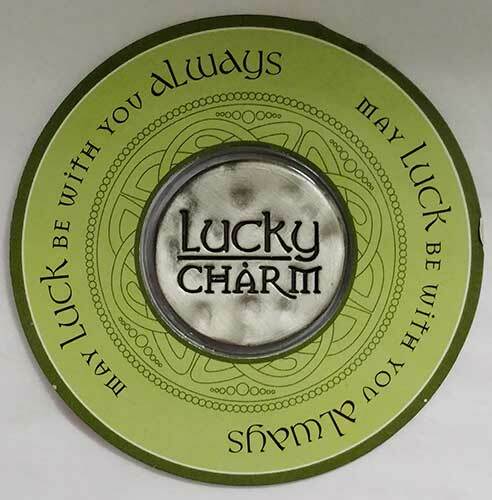 Connemara marble worry stone is an Irish charm that features An Irishman’s Philosophy on the packaging. 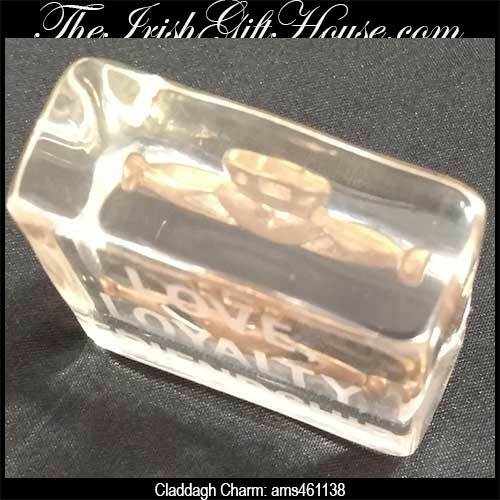 This Claddagh charm is encapsulated inside of a clear acrylic block. 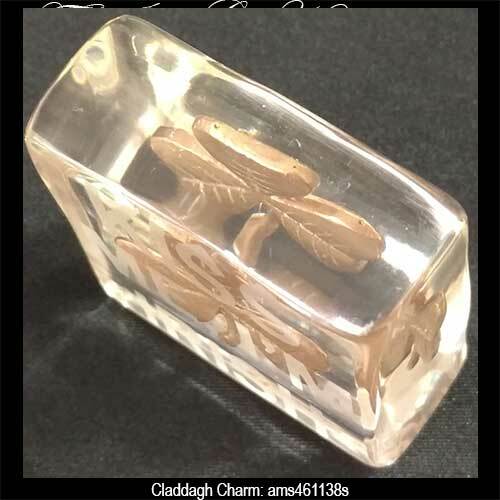 This shamrock charm is encapsulated inside of a clear acrylic block. 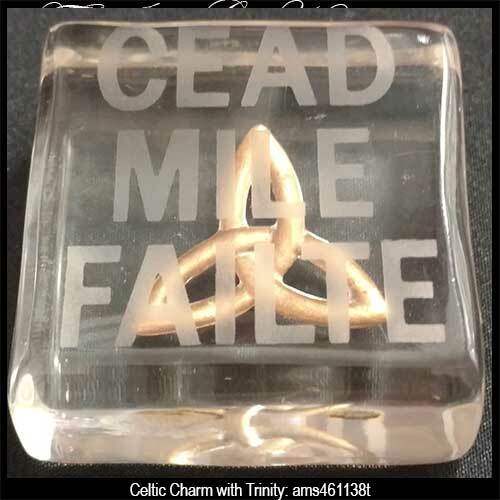 This Celtic charm features a Trinity knot that is encapsulated inside of a clear acrylic block. 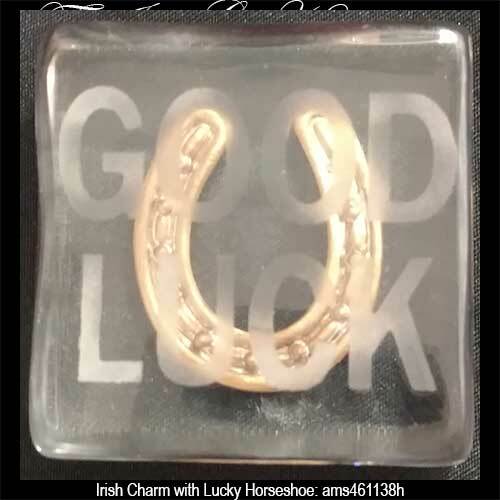 This lucky Irish charm features a horseshoe that is encapsulated inside of a clear acrylic block. This Irish charm features the Claddagh and it would make an ideal lucky pocket token. This Irish charm features a clover and a horseshoe and it would make an ideal lucky pocket token. 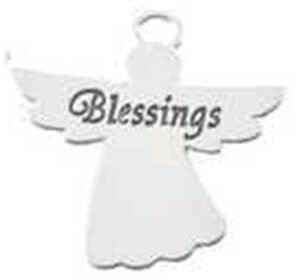 Irish angel charm features metal construction along with green enamel shamrocks and the word Blessings on the back. 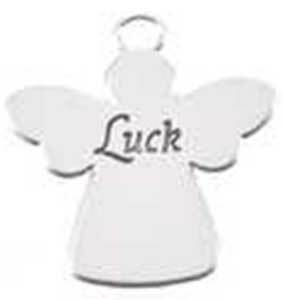 Irish angel charm features metal construction along with a green enamel accented Trinity knot and the word Luck on the back. 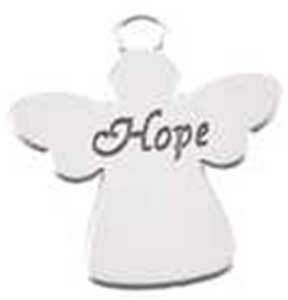 Irish angel charm features metal construction along with a green enamel accented Trinity knot and the word Hope on the back. 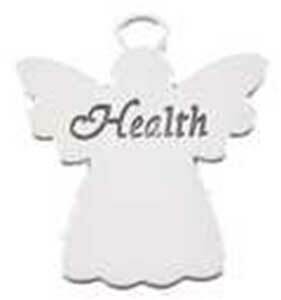 Irish angel charm features metal construction along with green enamel accented Celtic knot-work and the word Health on the back. 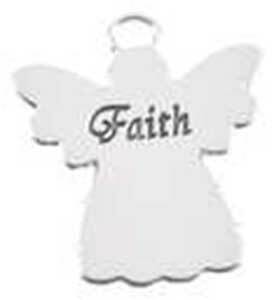 Irish angel charm features metal construction along with green enamel accented Celtic knot-work and the word Faith on the back. 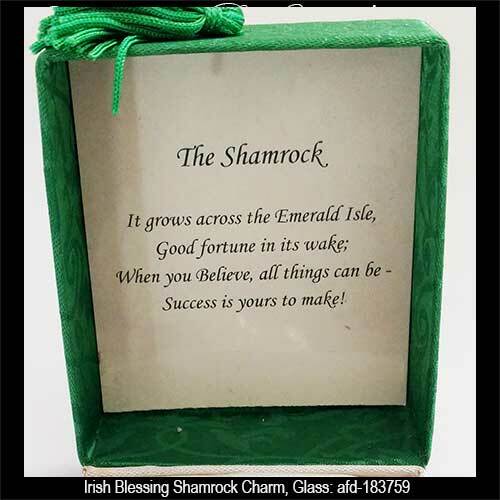 Irish charm is an embossed metal design with a horseshoe on one side and the words Lucky Charm on the other. Please visit these links if you are looking for jewelry as we have a host of Celtic charms that are ready to slide on to your bead bracelet. 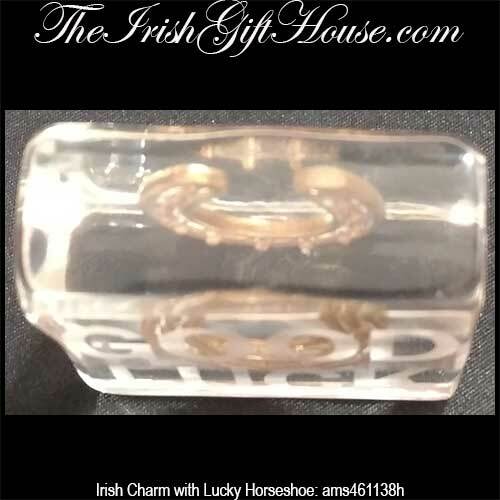 The Irish Gift House also has a selection of clip on Celtic charms that feature a lobster claw catch that make an easy addition to a link bracelet. Naturally, we also feature a selection of gold Claddagh charms that are ideal for use with your own chain along with sterling silver shamrock charms; many of these are enhanced with green enamel accenting. 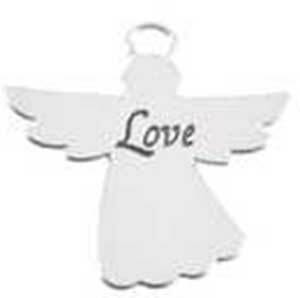 We have similar jewelry selections within most of our categories including harp charms and those with Connemara marble. We would be remiss if we failed to direct you toward one of the largest selections in this genre, the Celtic cross charms. Here you will find selections that are crafted in both sterling silver along with gold; additionally, we have sizes and styles that are suitable for either men or woman.